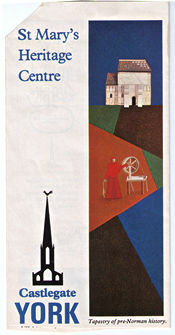 Back in the mid-1970s the church of St Mary’s on Castlegate found a new lease of life as the St Mary’s Heritage Centre. I wouldn’t have remembered this had I not recorded its existence in one of my childhood scrapbooks. 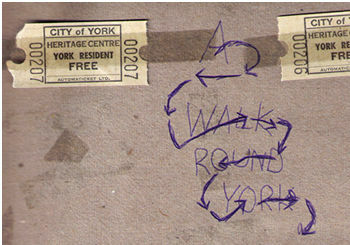 Later, it was known as The York Story, a fact which has come to mind as a result of the ‘York Stories turf wars’. This scrapbook, apparently compiled between 1974 and 1976, includes mention of several local museums visited. It has the usual tickets and leaflets carefully stuck into it with sellotape, which is now all brittle and yellowing. I’d also copied a logo from the leaflet, not just on this page, but on a later page of the scrapbook, suggesting that my childhood self had been deeply impressed by this new heritage exhibition. The church had been disused for some time, and declared redundant. After opening as the Heritage Centre around 1975, the venue was renamed ‘The York Story’. I went to The York Story too, some years later, and it might have been the memory of it that brought the ‘York Stories’ domain name to mind, in January 2004. I wouldn’t have dreamed of suggesting that I was qualified enough to provide ‘The’ York story. But the pluralist approach of ’stories’ seemed more appropriate for all the walks/views/observations I was gathering together online in an enthusiastic fashion. Crikey. They weren’t impressed, clearly. But I was. I was perhaps wowed by the ’sophisticated electronic elements’. Hard to recall what these were exactly (I doubt they’d seem sophisticated today) but I can remember loving it. If you remember visiting here, when it was St Mary’s Heritage Centre, or The York Story, I’d be interested in your memories of the place. An article in the Press archive from 5 August 2004 regarding lost ‘treasures’ of the city includes a brief and rather mysterious reference to it: ‘the York Story in Castlegate had an unhappy ending.’ Anyone know more about this? St Mary’s, Castlegate is now of course used for art installations and is managed by York Museums Trust. Brilliant Drake, thanks for remembering more detail than I did. That Hutchinson and Palliser book is a favourite of mine, really informative, nice turn of phrase, and with many wry observations on architecture and townscape disasters. But their comments above seemed a little harsh!